Which Skagway shore trip should you take? This Skagway shore trip looks pretty cool. For a remote Alaskan town, Skagway has a surprisingly large tour infrastructure. In fact, Skagway has the most diverse range of tours in all of Southeast Alaska, which means everyone can find a shore trip that suits their tastes. Wildlife, adventure, history, and frontier beauty are all possible on a Skagway shore trip, which sometimes makes it hard to narrow down your choices. This blog is all about helping you figure out which Skagway shore trip you should take. When choosing a Skagway shore trip, your first consideration should be your own physical limitations. If you get tired walking up a flight of stairs, you probably don’t want to book a tour where you have to hike up a mountain. If you have back or neck problems, ziplining may not be your best choice. If you have a fear of heights, a helicopter tour may cause you to freak out, and nobody likes other people freaking out on their helicopter tour. However, if you’re in good health and love adventure, you may want to choose one of these tours because Skagway is surrounded by unspoiled natural beauty that will knock your socks off unless you’re wearing sandals. History is interesting because stuff that happened a long time ago isn’t like the stuff that happens now. In the old days, Skagway was full of shootouts, scurvy, and brothels. today, there’s board meetings, head colds, and a grocery store. You can learn all about those more romantic times on numerous Skagway shore trips. 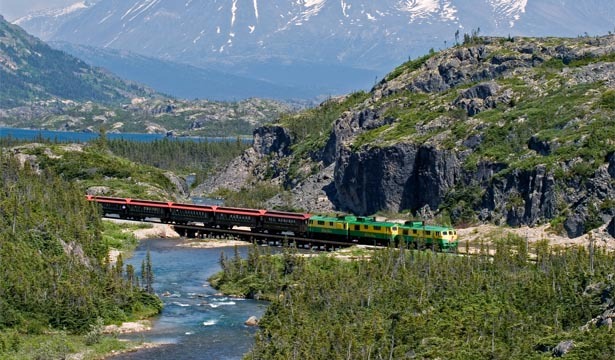 In many ways, the White Pass train tour is like a living museum, and the Klondike Gold Rush National Historic Park has four museums because they’re all overachievers. If you’re a nerd for historical stories, you have plenty of tour options in Skagway. One of the biggest draws for the State of Alaska is wildlife. Every tour brochure and television show features a jumping whale, schools of salmon, or angry bears. It makes you think that you can’t walk down the street in Alaska without worrying about getting trampled by a herd of wolverines. It is true that Alaska is full of wildlife, but you typically have to get away from town to find it. There are numerous Skagway shore trips where spotting wildlife is common because Skagway is in the perfect place for locating most Alaskan animals. We hear you! Glaciers are cool because you probably don’t have them where you live and may not even really know what they are. Like history, glaciers are old which adds to their overall wow factor. All that frozen blue ice is pretty amazing when it’s 80 degrees out. In Skagway, the best way to see a glacier is on a helicopter tour because you stand on it and even drink the meltwater. Flightseeing is another Skagway shore trip that gets you up close and personal with a whole gang of glaciers. Why do they call it flightseeing, though? You’re not seeing the flight. Your seeing other stuff. They should call it glacierseeing. If you’re like me, you need to eat. A lot. If you go a few hours without stuffing something tasty in your mouth, you may even get hangry. If my wife gets hangry, look out! If you’re a food enthusiast make sure that you book a Skagway shore trip with a snack or lunch. If it’s a longer tour, you may want both. If you need help choosing the perfect tour for you and your family, contact our local Skagway office and talk to our skilled and professional service agent. We actually live year-round in Skagway, so we have plenty of time to talk.